Below are driving directions to the registration office, all playing fields and local hospitals. Normal commuting times to Wakefield and Charlestown, RI are 45-50 minutes from Providence, RI and 15-30 minutes respectively from Mystic, CT. However, on a nice weekend there can be considerable traffic going toward the beaches in the morning and from the beaches in the afternoon. We suggest that you allow for this traffic by leaving an extra 30 minutes for getting to the fields (more if you have the first game of the day). When returning to your hotel on nice days beach traffic can be very heavy on Route 1 from mid-afternoon until 6 or 7 p.m.
From the North: Follow Route I-95 south to Exit 9 (Route 4, south - a left-hand exit from the passing lane). Take this exit. After traveling 10.4 miles, Route 4 joins with Route 1. Follow Route 1 south for 10.7 miles and take the Wakefield Business Exit. Turn right onto Old Tower Hill Rd and travel 1.3 miles. Turn right onto High St. and proceed 0.3 miles. The Club office will be on the left. Parking is available in the St. Francis Church parking lot adjacent to the Club office building. From the South: Follow Rt. I-95 north to Exit 3A (Sign -- "Route 138 East, University of Rhode Island"). Travel 14.7 miles east on Rt. 138 and take a right on to Rt. 1 - south. Go 4 miles & take the Wakefield Business Exit. Turn right onto Old Tower Hill Rd and travel 1.3 miles. Turn right onto High St. and proceed 0.3 miles. The Club office will be on the left. Parking is available in the St. Francis Church parking lot adjacent to the Club office building. From the Providence / Warwick areas (north) To get to your games, take I–95 South to the left-hand Exit 9 (Rt. 4–South). Stay on that road (it will turn into Rt. 1–South) until it intersects with Rt. 138–West (at a traffic light). Proceed about another 6 miles and take the exit for Tuckertown Fields (see brown state sign). 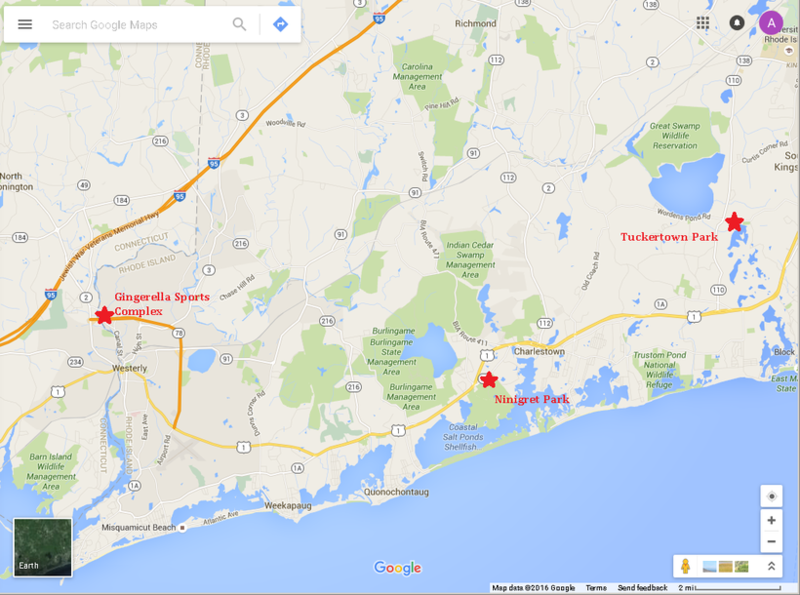 Go 0.2 miles from the end of the exit and take a left on to Tuckertown road. After going 2 miles on Tuckertown road you will see the entrance to Tuckertown Park on left. To return, exit the Tuckertown fields by turning right on Tuckertown Road and proceed to the end. Turn right on to Post Road and enter Rt. 1–South. As soon as you can, make a U-turn on to Rt. 1–North. Continue up Rt. 1 until it changes to Rt. 4–North, which will lead you back to I–95 North. From Mystic, CT / Southern RI areas (south) To get to your games follow I–95 North to RI Exit 3A (See sign for "Rbboute 138–East, University of Rhode Island"). Proceed 9.3 miles on Rt.138–East to a traffic light at the intersection with Rt. 110. Turn right on to Rt. 110 and proceed about 3.8 miles to a blinking traffic light. Turn left at the light on to Tuckertown Road. The entrance to the fields will be about 300 yards up on your right. To return, exit the Tuckertown fields by turning left on to Tuckertown Road and proceed to the end (flashing traffic light). Turn right on to Rt. 110 (Ministerial Road) and continue to end at junction with Rt. 138. Take Rt. 138–West and continue 9.3 miles to the I–95 South entrance. From the Mystic, CT Area: Take Rt. I-95 north from the Mystic area and proceed about 10 miles to the Rt. 216 exit in Clarks Falls, CT. (we suggest you avoid taking CT Rt. 2 to RI Rt. 78 connector because of beach traffic). Take the exit and proceed south on Rt. 216 - the route will become RI Rt. 216. Follow Rt. 216 for 8.4 miles until it ends at Rt. 1. Take Rt. 1 north (a left) for about 2.8 miles and take the exit for Rt. 1A, Old Post Road, Ninigret Park. Go about 0.2 miles on Old Post Road and turn right on to Park Lane - the park entrance. Follow signs for parking. To return, you retrace your steps. From the Providence / Warwick areas (north): Take I-95 south to the left-hand Exit 9 (Rt. 4– south). Stay on that road (it will turn into Rt. 1–south) for about 16.5 miles and watch for the Wakefield Business District exit. Continue past that exit for about 12.6 miles and look on the left for a sign for Ninigret Park, which will involve a left- hand exit and U-turn on to Rt. 1–north. Then almost immediately exit right on to Rt. 1A¬ - Old Post Road. Go about 0.2 miles on Old Post Road and turn right on to Park Lane - the park entrance. Follow signs for parking. To return, retrace your steps up Rt. 1 North, Rt. 4, north to I -95. Make sure the player's medial release form is sent with the player. If the person is being taken by ambulance, be sure to confirm that its destination is South County Hospital and not some other nearby hospital. From the Ninigret Park Fields: Turn left when exiting the Ninigret Park exit and proceed about one-third of a mile. Turn right to enter Rt. 1, north. Go about 11. 1 miles and take the Salt Pond Road exit toward South County Hospital. At the end of the exit turn left on to Salt Pond Road. In 0.2 miles take a left on to Kenyon Avenue. Look for the Emergency/Express Care entrance about 0.1 miles ahead on the left. Turn left when exiting the Ninigret Park exit and then proceed about 1/3 of a mile. Merge right to enter Rt. 1, north; Immediately get in left lane. Go about 0.2 miles and make a U-Turn on to Rt. 1, south ( If you miss it there will be another opportunity up the road a bit. Proceed 8.8 miles on Rt. 1, south and turn left on to Wells Street. The hospital is on your left about one-half of a mile up Wells Street.